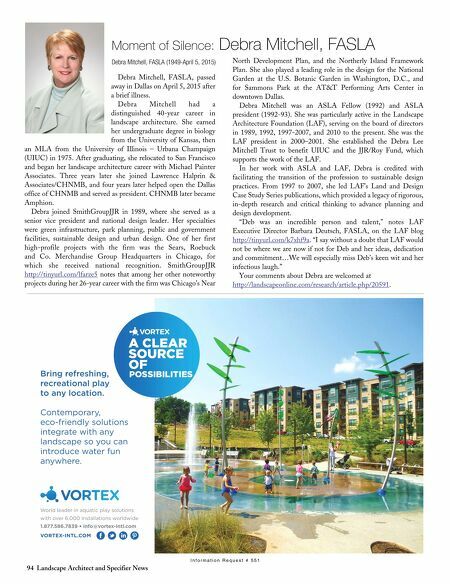 94 Landscape Architect and Specifier News Debra Mitchell, FASLA, passed away in Dallas on April 5, 2015 after a brief illness. 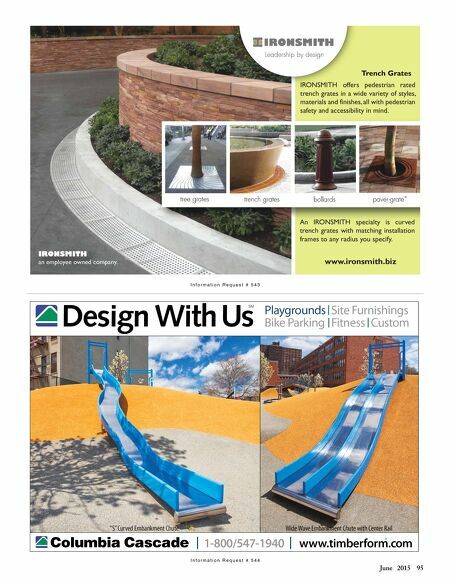 Debra Mitchell had a distinguished 40-year career in landscape architecture. She earned her undergraduate degree in biology from the University of Kansas, then an MLA from the University of Illinois – Urbana Champaign (UIUC) in 1975. After graduating, she relocated to San Francisco and began her landscape architecture career with Michael Painter Associates. Three years later she joined Lawrence Halprin & Associates/CHNMB, and four years later helped open the Dallas office of CHNMB and served as president. CHNMB later became Amphion. Debra joined SmithGroupJJR in 1989, where she served as a senior vice president and national design leader. Her specialties were green infrastructure, park planning, public and government facilities, sustainable design and urban design. One of her first high-profile projects with the firm was the Sears, Roebuck and Co. Merchandise Group Headquarters in Chicago, for which she received national recognition. SmithGroupJJR http://tinyurl.com/lfarze5 notes that among her other noteworthy projects during her 26-year career with the firm was Chicago's Near Moment of Silence: Debra Mitchell, FASLA Debra Mitchell, FASLA (1949-April 5, 2015) I n f o r m a t i o n R e q u e s t # 5 5 1 North Development Plan, and the Northerly Island Framework Plan. She also played a leading role in the design for the National Garden at the U.S. Botanic Garden in Washington, D.C., and for Sammons Park at the AT&T Performing Arts Center in downtown Dallas. Debra Mitchell was an ASLA Fellow (1992) and ASLA president (1992-93). She was particularly active in the Landscape Architecture Foundation (LAF), serving on the board of directors in 1989, 1992, 1997-2007, and 2010 to the present. She was the LAF president in 2000–2001. She established the Debra Lee Mitchell Trust to benefit UIUC and the JJR/Roy Fund, which supports the work of the LAF. In her work with ASLA and LAF, Debra is credited with facilitating the transition of the profession to sustainable design practices. From 1997 to 2007, she led LAF's Land and Design Case Study Series publications, which provided a legacy of rigorous, in-depth research and critical thinking to advance planning and design development. "Deb was an incredible person and talent," notes LAF Executive Director Barbara Deutsch, FASLA, on the LAF blog http://tinyurl.com/k7xhf9a . "I say without a doubt that LAF would not be where we are now if not for Deb and her ideas, dedication and commitment…We will especially miss Deb's keen wit and her infectious laugh." Your comments about Debra are welcomed at http://landscapeonline.com/research/article.php/20591 .